I started thinking about Schoenberg in Hollywood over 20 years ago, when I came across a remarkable book by Alexander Ringer called Arnold Schoenberg: The Composer As Jew. The book was a revelation. I had long admired Schoenberg’s music but didn’t know about his complex relationship to Judaism, or about how Nazi critics used his Judaism as a way of justifying their hatred for his music. I also discovered in that book the story of Schoenberg’s meeting with MGM’s Irving Thalberg—to whom he was introduced by Harpo Marx—soon after Schoenberg’s arrival in Los Angeles. All of this made me think about the interpenetration of politics and art, and about the tension between artistic purity and popular acclaim, in a fresh, broader way. Schoenberg’s journey—musical, spiritual and political—emerged for me as one of the great stories of our time, one that I wanted to tell. His meeting with Thalberg, poignant and comically absurd, felt like the pivot around which the arc of Schoenberg’s life could be explored. I sensed that this was an ideal story for exploring the tricky relationship between uncompromising art and mass appeal, and of whether—and how—art can change the world. Creating this opera became a sort of obsession for me, but many thought that it was too wild a story or too impractical to produce. When Esther Nelson approached me about writing a new work for Boston Lyric Opera, I told her about this Schoenberg idea and she immediately said, “This is it!” I am deeply grateful to her for believing in the project and for giving me the opportunity to realize this dream. 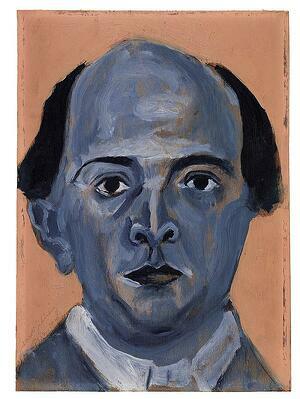 I grew up immersed in Schoenberg’s musical world. My parents’ tastes in music were highly eclectic, and our home was filled with Bach, Beethoven, Schoenberg, Cage, and beyond. At Juilliard, I studied with the composers Roger Sessions and Elliott Carter, both of whom had been deeply influenced by Schoenberg. When Sessions described Schoenberg’s vast importance by telling me that “Schoenberg owned the estate where Berg and Webern were the gardeners,” I knew exactly what he meant. You really can find everything in Schoenberg, much as you can in Bach. I was drawn to the deep expressivity and richness of Schoenberg’s music, to the way it absorbs the past while always feeling totally new, and to the way his music combines overwhelming emotion with powerfully rigorous—but always imaginative and non-academic—intellect. There were many complex aspects to this project, but finding the right musical language and sound world was perhaps the most challenging of all. I wanted the work to be infused with Schoenberg but not to be a pastiche. I also wanted it to tell the history of musical language, because Schoenberg’s music evolved so much and in itself incorporated so much previous music. Lastly, I wanted to find a musical language for this opera that could be poised on the razor’s edge between accessibility and complexity, dipping from one side to the other with the slightest tweak. Not surprisingly, I had to invent my own language to do this. So most of the music in the opera is mine, although there are a few quotes from Schoenberg as well as a kind of blitz near the end with a lot of Schoenberg fragments juxtaposed, as if we were able to glimpse suddenly into his musical mind. The opera builds to a climax called “Schoenberg’s Vision,” in which I imagined what it would sound and feel like to reconcile the many opposites that Schoenberg grappled with, if only for a moment. To do this, I had to find melodies, harmonies, and textures (augmented subtly with electronics) that follow their own logic while both welcoming and illuminating Schoenberg’s own. I hope that audiences are tantalized, challenged, and delighted by this music, and go away with some tunes to hum—perhaps some of them in 12-tones. I also hope that audiences will leave the opera admiring and loving Schoenberg as much as I do. He is one of the greatest composers who ever lived and, in my view, many people still do not appreciate the breadth of his achievement or the richness of his legacy. The title of the opera is not exactly misleading, but it is a bit sly. When I started imagining the piece, I thought that it would mostly revolve around Schoenberg’s life as an exile in the Los Angeles of the 1930s and 1940s. The whole opera could have been filled with tennis matches with George Gershwin and garden parties with Charlie Chaplin. But Braham Murray—my close creative collaborator on the project, as he had been on my Resurrection and Skellig operas, and to whom I have dedicated this opera—had the idea of using the Thalberg meeting as a framing device from which Schoenberg would reconsider his whole life…through the lens of film history! 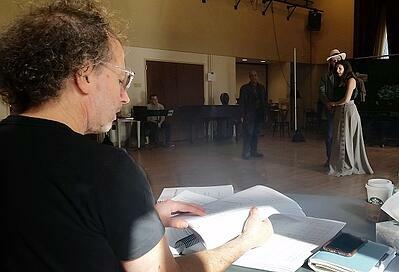 So while the opera begins and ends in Hollywood, we also journey with Schoenberg more widely through place and time. I’d like to extend special thanks to my friend and colleague Leslie Epstein for valued advice during the initial phase of this project. And I am very grateful to the many wonderful collaborators on this project, from the brilliant actor and writer Simon Robson who has crafted a most intricate and witty libretto, to media artist and MIT Media Lab grad Peter Torpey who has imagined projections that shift the stage from filmic to very real in a lightning flash, to Ben Bloomberg who has worked his characteristic sonic magic to blend acoustics and electronics in subtle and startling ways, to choreographer Karole Armitage who designed the movement language for the piece and then took over the direction following Braham’s passing, and to the amazing singers, musicians, production teams, student engineers and artists at the MIT Media Lab, and so many more. Because I often invent new technologies and because many of my musical projects are quite multidisciplinary, I typically collaborate with all kinds of people, from experts, to teams of graduate and undergraduate researchers, to thousands of citizens from every conceivable background in my City Symphony projects. But in this opera, it feels as if I have been collaborating with Schoenberg himself, trading with him sounds and ideas and experiences and even jokes. I have learned immeasurably from “Arnold” during this process, and I hope that what we have done in Schoenberg in Hollywood—together—would have made him smile, and sing…and maybe even dance. This piece was originally published in the program book notes for Schoenberg in Hollywood. 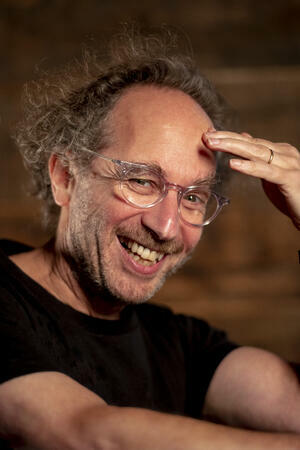 Images: Tod Machover (photo: Andy Ryan); Schoenberg's Blue Self-Portrait (1910); Tod Machover in rehearsal for Schoenberg in Hollywood (photo: Madison Florence/BLO).